Sheriff Walt Femling is hanging up his badge after 24 years as Blaine County's top law enforcement officer. 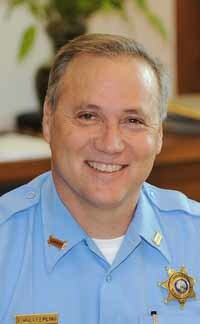 Femling's resignation, which becomes effective March 1, was announced late Wednesday. The sheriff cited health reasons but has declined to discuss his ailment. "I just don't want to be specific," Femling said. "It's a private matter. I'll be OK—I want everyone to know that. I just need to concentrate on it." The task of selecting a new sheriff will be the responsibility of Blaine County's three commissioners, who will make the selection from a list of three candidates submitted by the Blaine County Central Republican Committee. Femling's repeated success as a Republican is somewhat unusual in a county predominantly Democratic, but he has nonetheless been elected six times as sheriff. He was first elected in 1986 and last elected in 2008. Now 54, Femling has been a law enforcement officer for 31 years. He served as a sergeant with the Ketchum Police Department for seven years before becoming sheriff. He declined to say whether he has a preference of who will become his successor, saying that the decision is "up to the commissioners." The new sheriff will fill out the remainder of Femling's current term and will then be eligible to run for election in 2012. Femling said his decision to resign was difficult, but he thought it best for the county and for himself.